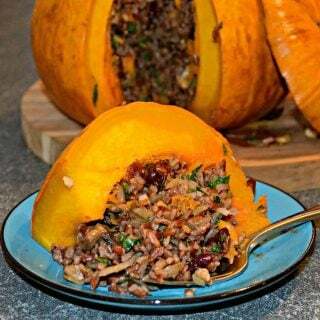 Tender, sweet, baked stuffed pumpkin with a delicious mixture of rice, vegetables, nuts & cranberries. A beautiful centrepiece for your Thanksgiving or Halloween gathering! Being relatively new to Canada, Thanksgiving is still a novelty for us. In England, although we kind of celebrate with harvest festivals etc, there is no national holiday like in Canada or the US. As you can probably imagine, I am always open to celebrations which involve copious amounts of food and drink so I now fully embrace Canadian Thanksgiving! An extra day off work and more time to spend with my family is an added bonus! 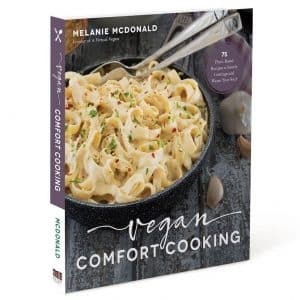 This will be my third Thanksgiving and my first vegan one so I have been busy creating a couple of great festive recipes to share with you. I am sharing this savoury recipe today and then later in the week will come a glorious dessert…. 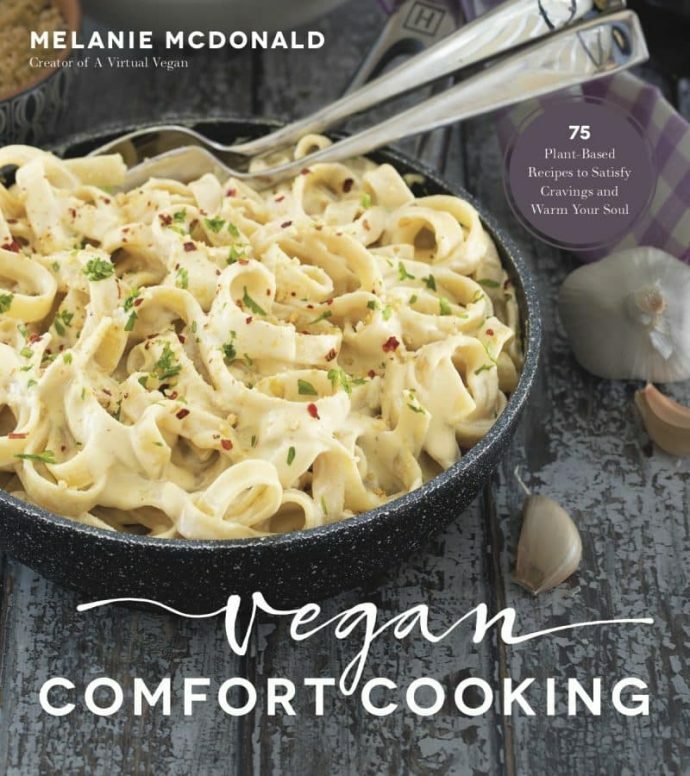 Vegan food is often stereotyped as being bland and boring. This magnificent looking Roast Stuffed Pumpkin centrepiece is anything but! 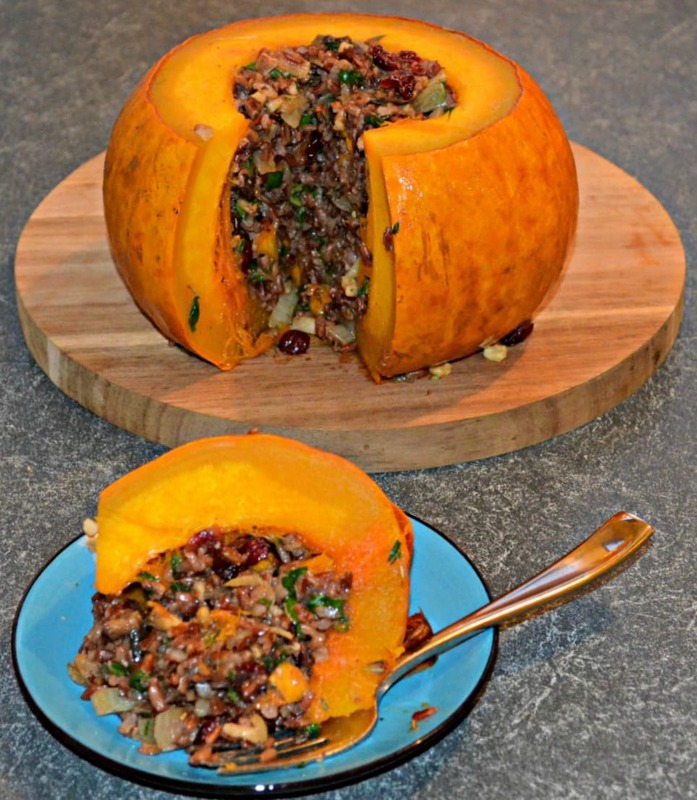 Filled to bursting with a delicious mixture of rice, vegetables, nuts and cranberries, this pumpkin in all it’s orange rotund glory is just beautiful. This Roast Stuffed Pumpkin is deceptively easy to put together and can even be made in advance, wrapped in foil and stored in the fridge until you are ready to roast it. How great is that? A totally stress free day with no messy prep work! As well as being great for Thanksgiving this Roast Stuffed Pumpkin makes a fantastic Halloween dinner centre-piece and if you love Halloween as much as me then you might want to check out this round up post which I wrote for Parade’s Community Table. It features 20 Frightfully Spooktacular Vegan Halloween Recipes and is sure to please your little (and big) monsters! I would love to see you serving my Roast Stuffed Pumpkin at your Thankgiving celebrations, so please share your pictures on Instagram (@avirtualvegan) and add the hashtag #avirtualvegan so I don’t miss them! Or you can post a comment on my Facebook page. It would also be great if you could leave some feedback in the comments section below . 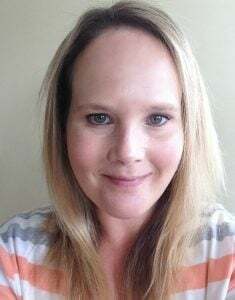 I love to know what you think of my recipes and a positive comment helps others see that my recipes are reliable. If you love pumpkin then you might also enjoy my Pumpkin, Pecan & Chocolate Granola Bars. 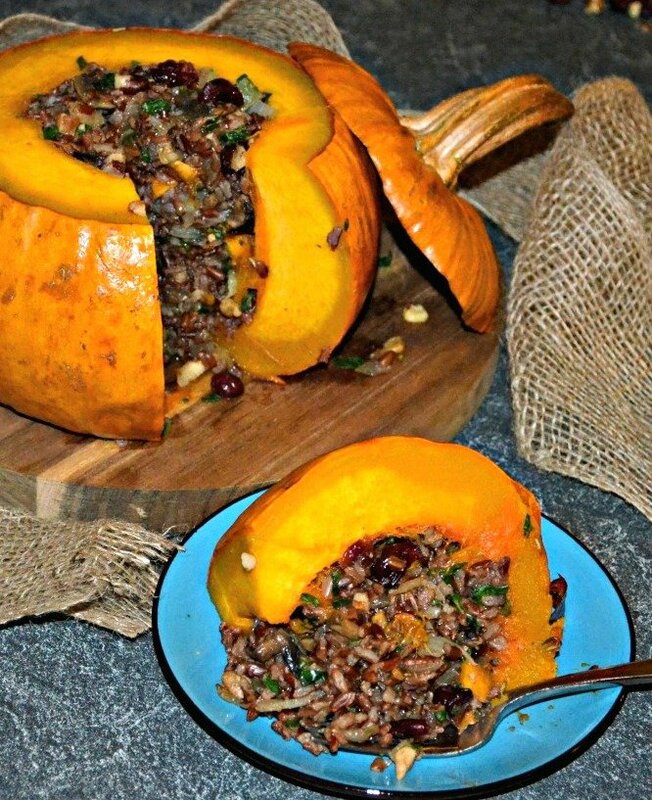 Tender, sweet, baked pumpkin stuffed with a delicious mixture of rice, vegetables, nuts & cranberries. A beautiful centrepiece for your Thanksgiving gathering! Toast the walnuts in a fry pan over a medium heat for a minute or two moving constantly. Carefully cut the top off the pumpkin (about the top third). Remove the stringy innards and discard. You can also discard the seeds although I recommend roasting them (see recipe notes). Spoon into the pumpkin cavity, pressing down well as you go. You want it packed in very tightly. Wrap completely and tightly in tin foil. At this stage the pumpkin can be stored in the fridge for a day or two before baking if you want to get it ready ahead of time. If your pumpkin is significantly different in size to mine then there is a trick for you to work out how much rice you need to fill it. Just cut the top off and remove the stringy innards and seeds as per my directions. Place a plastic bag inside the cavity and put enough rice in the bag to fill a little under half of the pumpkin. remove the bag, add the rice to a pan and cook as per directions on packet. You may also need to adjust the other ingredients slightly to suit your either smaller or larger pumpkin.